Cold War anxieties play out in a sensitively told story set during the Cuban missile crisis in the 1960s, perfect for fans of Gary Schmidt and Kristin Levine. But then President Kennedy comes on TV with frightening news about Soviet missiles in Cuba—and that’s where Sam’s heading. Suddenly Joanna’s worries about being home alone, building up the courage to talk to a cute boy, and not being allowed to go to the first boy-girl party in her grade don’t seem so important. Maybe sometimes there are good reasons to break a promise. The tense timeline of the Cuban missile crisis unfolds alongside a powerful, and ultimately hopeful, story about what it means to grow up in a world full of uncertainty. Gayle Rosengren grew up in Chicago. Like Joanna in Cold War on Maplewood Street, she enjoyed school, was a voracious reader, and loved dogs and horses. She attended Knox College, where she majored in creative writing and was the editor of the literary magazine. Gayle never outgrew her passion for children’s books, and worked as a children’s and young adult librarian at Fountaindale Public Library in Bolingbrook, Illinois, for several years, enthusiastically sharing her love of books. Gayle eventually moved to Wisconsin, but by then she was the mother of three children. She worked in a reference library and as a copyeditor, and she wrote short stories for children that appeared in Cricket, Ladybug, Jack and Jill, and Children’s Digest magazines. Now Gayle writes full-time just outside of Madison, Wisconsin, where she lives with her husband, Don, and their slightly neurotic rescue dog, Fiona. She is living her dream, she says, writing books she hopes will make the same difference in children’s lives as her favorite authors made in hers. 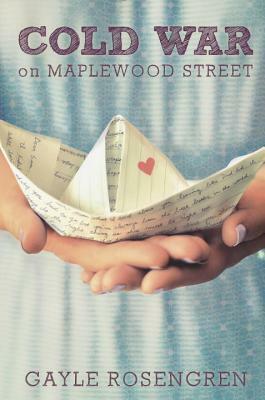 Cold War on Maplewood Street is her second novel for young readers.